Saying our March Guest Editor Jacob Tobia is busy is an overwhelming understatement. From appearances on TV to nationwide book store appearances and tons of traveling, Jacob is doing their best to get some reading in between their busy schedule. Check out what Jacob is reading next and don’t forget to order your copy of Sissy: A Coming-of-Gender Story. Don’t forget to pick up your copy of Sissy: A Coming of Gender Story by Jacob Tobia! Jacob Tobia is a writer, producer, and author of Sissy: A Coming-of-Gender Story with Putnam Books at Penguin Random House. 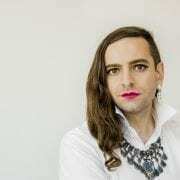 From interviewing former US Presidents to working with queer and trans youth, Jacob helps others embrace the full complexity of gender and own their truth, even when that truth is messy as hell. Currently living in Los Angeles, Jacob was recently named to the Biden Foundation’s Advisory Council for Advancing LGBTQ Equality and the Clinton Global Initiative Honor Roll.